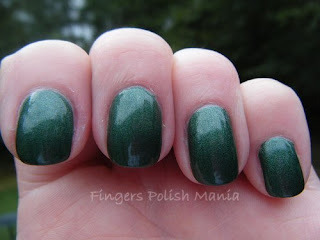 fingers polish mania: Have you ever seen a green ladybug? So here I sit, waiting for the damn dishwasher installer to get here. I asked for the 8-12pm slot and they gave me the 11-3pm slot. Well it's 2:36 as I write this, and still no call from the installer saying they're coming. I hate this! It really makes me mad to have to sit here waiting thinking they aren't even gonna come. Such an awful way to spend the day. And guess what-they never showed up! Now I'm pissed! Anyway, for today's look, I decided I needed some green in my life. I have been eyeing this color on several blogs lately and finally got it for myself. Take a look at ManGlaze Nawsome Sauce and Glitter Gal Black holo resting on a beach of shells. 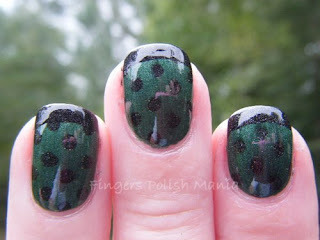 Now I realize that you can't really see the green yet-the ManGlaze polishes have funky art on their bottles. 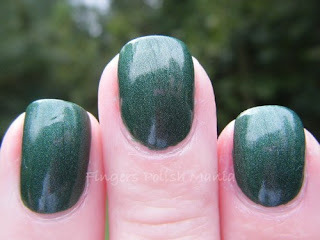 This polish was made to be a matte, but I'd seen it on other blogs with a shiny top coat and thought it looked even better. So I didn't even take pictures of the matte state. You can google that elsewhere. For me, this green is awesome. I can't even tell you how cool the shimmer is on this one. You just have to see it. Can you see the shimmer? It's like all different colors. It doesn't look anything like this matte. The shimmer is what makes this so freakin' cool in my opinion. It may just be my new favorite green-or at least in the top 5! I then took my Glitter Gal Black holo and stamped with M79 and added my signature funky french. Here is what happened. In my head, I thought I was being hip picking a cool green with a black holo. The minute I saw this, I thought, man that looks like a green ladybug! What have I done? I have to tell you that I am actually digging these two colors together. I am in love with the shimmer in both these polishes. I can't stop looking at my nails. However, I am under no delusion that all you will see is a green ladybug. I also want to point out that this shimmer is all in this polish. I did not use any of my CND effects to make this happen, although I may add it at a later date just to see what happens. 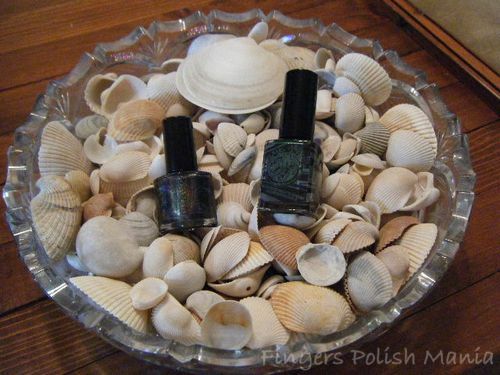 This Nawsome Sauce is a shimmerfest party on your nails. I give it two thumbs up.